Sometimes, when we take on some of the bigger challenges we face in life, whether it’s weight-loss or graduating college, we can be overcome with the thought that whatever we’re working toward is just not possible for us. This is quite normal, so don’t beat yourself up. In this episode, I’m sharing with you why this is happening in our brains regularly on a much smaller scale. 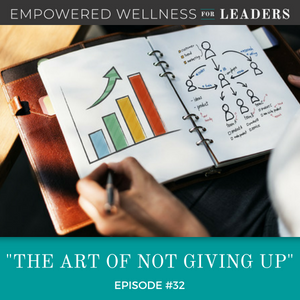 Give-up moments can be sneaky and you might not even notice them, but tune in to discover how, by looking at your results, you can really keep those thoughts in check. I cannot wait to share with you what I’ve been experiencing around these mini give-up moments in my life and how we can use them to make the most amazing shifts ever towards believing more. Buckle your seatbelts, ladies, and gents – I think this is going to be a powerful episode. Download my worksheet to dig into this concept a little deeper and start seeing where you’re giving up in your life without even realizing. And if you want to be the first to know about my FREE fall training, click here! What I mean by mini give-up moments. One simple process of catching yourself in these give-up moments. Why you are capable of resisting the urge to quit. What exactly our minds crave relief from when we decide to give up. Download this episode’s free worksheet! Sign up to be the first to know about my free Fall training! What I’m going to share with you on this episode is that these moments are happening in our brain much more often than we think; in the big moments and also in little mini-moments. And they are causing unnecessary misery. I cannot wait to share with you what I’ve been experiencing around the give-up moments in my life and how we can use them to make the most amazing shifts ever towards believing more; believing more than ever we have around what we most want in our lives. Buckle your seatbelts, ladies and gents; I think this is going to be a powerful episode. I have very clear memories of one of those moments. When I was struggling with my weight, I had a moment where I was just so discouraged and I was gaining weight at such a pace that I was starting to be scared that being very overweight was my life-sentence. Clothes were shrinking at the dry cleaners. I was having to shop every time there was an event because nothing would fit anymore. I had only one pair of black pants that worked and a very tight pair of Spanx. I was miserable and I was scared. I remember the moment where I said, “Maybe I’ll just stop battling this and just be a really big woman. I can’t take this anymore.” And you know – it really freaked me out. The thing I did desire most was being in a natural weight body, being comfortable in my own skin. I wanted to walk into my closet knowing that everything fit. I wanted to be confident and I certainly did not want to be ashamed anymore. And I was just about to give up on the dream of solving all that, of creating that. And the freak out caused me to stop, almost to be mad; not at myself, but that I would literally give up something that was really, really important to me. That was the beginning of a beautiful journey of finding out what worked for me and starting to believe in myself again because in that moment where I was about to give up, there was a small but powerful belief that I could figure this out; this losing weight for good. I sought support and help and it ended up being actually easier than I ever thought it could be and I’m so thankful for that moment. And don’t worry, you do not have to have that dramatic drop-dead freak out moment like I did to get the results that you want in your life. And do you know what I realized is true? I have those mini give-up moments more often than I’d like to admit, and that’s why I’m bringing this episode to you today. What I want to do today is to help you, wherever you are on the believing it’s possible scale around the thing that you most want in your life and to give you a few tips and an opportunity to learn not just how to turn it around but to sustain great action towards what you most want in your life, whether it is losing weight for good, passing a really tough certification exam, finishing school per se, hitting your sales goals, and consistently, right – I’m going to talk about that in a minute – improving your relationships or feeling confident in your own business, or just in your life. Why do we give up or give up like this? To get relief from all the crappy emotions that come from not believing and from feeling that you’re stuck, and also all the emotions that come from beating yourself to a pulp. Listen, we think we want relief from the diet, from the tough workout, from the hard part of building a business. We want relief from the cold calls. We want relief from studying all day and night or relief from the day to day grind of running your business. No, we don’t want relief from those things. Most of us are really quite capable of hard work. What we want relief from is the misery that we’re creating in our own mind that we can’t have what we most want that’s on the other side of that journey and just that we’re just never going to reach our goals. By quitting or even entertaining the idea of quitting, you are falsely protecting yourself from discouragement and disappointment. The truth is this; your belief that you can’t have what you want or your belief that it’s really hard or that you’re not good enough, all these come up during these journeys. When all those thoughts come up, that’s what you want relief from. You want relief from all the negative thinking because that, my friends, creates some very heavy and daunting emotions. I’ll remind you; when you think that it’s hard, how does it feel? It slows you down. It feels like molasses. When you believe and keep thinking that you’re never going to have what you want, that creates deep discouragement and disappointment. When you think you’re not good enough, you will be mopey and sad. That does not create beautiful action and that’s what you want relief from. You don’t want relief from the hard work; you don’t want relief from all the actions. What our soul or mind or body or us are wanting so much is relief from the deep and dark emotions. So the good news is this; if you can create the big emotions of disappointment and discouragement that I just spoke of, you are just as capable of being able to create the powerful and effective emotions of confidence, excitement, persistence, positivity, and truly believing it’s possible even when you can’t see the results just yet. Why is this true? Because what you believe and think on a daily basis about your life, your work, and anything, creates an emotion. That emotion creates either action or inaction. And when you create positive emotions more often, you create more results. Negative emotions, typically, will shut us down. Positive ones typically get us moving. And when we’re on the move and continue to take more action because we’re believing more positively or thinking more positively, we will see more consistent results. What’s really fascinating also is that when we create more consistent believing positive emotions, all those ones I mentioned – I’m going to repeat them because they feel so good – confidence, excitement, persistence, positivity, true belief – which I feel like is a ball of really great emotions when you truly believe something. It also creates a lot of clarity. When I’m in that space, when I’m in a believing space, when I’m thinking really positively, I come up with amazing clarity and what I’ve seen happen after that is that’s when I create all of my best ideas, not only for my business but for my life. How do we leverage this? How do we truly apply it to our lives? How are you going to apply it to your life today? I want to make this concept to clear that you’re going to be shocked and surprised about how simple it is and I want you to practice it the next time that you notice that you’re frustrated, disappointed, and want to step back. Again, this is a really simple process. It’s catching it, noticing it, and really doing something new in those moments. When you notice you want to shrink back, I want you to start paying attention. So the first step – notice. Notice the despair. Notice the frustration. Notice the Icky emotion that makes you want to give up in the moment. Honor it; don’t avoid it. Emotion will not kill you, it is just a vibration in your body. Now, I want you to stop and write down every reason why you’re upset right now. Keep writing until it feels clear that the thoughts you’re writing down on that paper are why you feel so bad. Write until you can’t think of anything more about why you’re upset. Be honest about why you’re upset. Give yourself permission to just think and feel what you’re feeling in that moment. Once you’ve seen that all on paper, I want you to take some very gentle breaths. Get back into a very neutral space. Now, this is the best part; start practicing believing and then you’ll start being able to take easy action out of that belief and not the disappointment. This is how you do it. What would I be doing – and this is what you ask yourself – what would I be doing if I already had lost the weight? In this moment, I just overate the biggest piece of chocolate cake – and you go through this process and you go, why are you upset? Why are you so disappointed? Write everything down and then ask the question, “What would I be doing if I already had lost the weight?” That’s your wisdom. While you’re in the grind of getti8ng the certification, passing your boards, doing something really big, what would you already be doing in this moment of despair if you already had the degree, if you already were working in the job that you really wanted? What would that person, you on the other side of the struggle, what would that person tell you in the hard moment? If it’s around making a money decision and you don’t feel like you have enough money for what you really want to do, I want you to position yourself. Write down every despair, every ugly thought around not having the money; you’re really disappointed and discouraged. And then, what would I do not if I had the money in the bank? This is all putting ourselves in a believing space on the other side of the struggle. And if you already had the success that you’re dreaming of, what would you decide now? This is your new to-do list. Every single time, I want you to notice the difference in action when you’re discouraged. You’re going to notice, when you’re discouraged and disappointed, you shrink back. It feels hard, but notice the action when you’re in a great place; you just made a big sale or you really figured something out or, “Wow, that concept wasn’t so hard that I just studied…” or you lost three pounds. Alright, that is a circumstance, but leverage that. When you’re feeling really, really good, notice the action you take when you’re believing. It’s expansive, it’s easy, it’s flow. But what’s really cool is all you need to do is change your mind. You don’t have to start losing the weight to believe that it’s possible. You do not have to pass the exam to believe that it is in your reach. You don’t have to have the money to know how you should be investing right now. Those are just circumstances. How we believe and think causes such a strong emotional state and that emotional state, whether it’s positive or negative or even just neutral, it creates the actions in our lives every single time. And don’t ever give up on what’s important to you. Take time to honor any disappointment and build a new belief now. I want to highlight something here; many moments of discouragement or give-up moments can be really sneaky and you might not even notice them unless you look more closely at your results. So if you’re seeing an ebb and flow on the scale, lose two pounds, gain two pounds, have a great sales month, not so great sales month, great relationships with your friends and family, not so good the next month, you might need to look at the way that you are believing. You might be throwing up your hands in defeat in a different way. It might not be so dramatic as mine that I shared in the beginning. I’ve only had two of those really drop-dead, “I’m going to give up on my belief. I’m going to give up on what I’m working on.” But the mini-moments are sneakier. If you’re noticing that your results are inconsistent, the most powerful tool will be to evaluate your results through a positive lens, like we did in the turnaround episode last week. Always do it through a positive lens; what is working and what isn’t working and what do you want to do next? But when you really feel like giving up, I want you to do this activity. Allow the emotions that you’re creating by feeling like it’s so difficult. When you’re feeling that despair, if we ignore it, it’s much harder to turn around. So honor the emotions you’re feeling, write down every reason why. Take a breath and put yourself into a believing space. These types of questions help me to make better decisions and move towards my goal every single time. Try these; what would I be doing if I was 100% confident right now? How would I spend money on my business or on myself if I already had money in the bank? How would I be taking care of myself if I had plenty of time? How would I be eating if I already had lost the 30 pounds? What would I do in this moment if success was absolutely guaranteed? Use these questions. I’m going to have them in the show notes so that you can rely on them. Our brain loves to answer questions and when we ask really good ones, it gives us great opportunities. Again, don’t ever give up what’s important to you to avoid the pain. Get your brain in on the action and ask it to turn around. You’ve got this, I just know it. What we’ve done here is gone deeper on how to be resilient around anything that trips us up. It’s your power tool. I want you to know where to get additional resources if you’re loving the podcast. First of all – thanks for listening. Second – share the podcast. It’s a beautiful way to help someone else’s life. Don’t keep it to yourself. Next, I provide resources in virtually every podcast, so click the show notes, dianamurphycoaching.com/32. You can sign up for my next free training, which is coming in October, and you can get the downloaded worksheet and dig into this concept yourself. In addition, I have videos that I’m posting, live videos on Facebook, and those are always on Diana Murphy Coaching, on my business page. If you’re more a visual person and want to actually ask me questions, it’s a great place to intersect with me there. I love that you’ve been here today. And most of all, don’t give up. All you want to avoid is an ugly emotion and I just want you to know, you got this. Have a great week.